Link to the Order Form and other product categories via the navigation bar at the top and bottom of the page. Ties are 57" long and 3 3/4" wide unless otherwize noted. Background color choices are noted in the description. In ties designated as "woven" the design develops in the weaving process instead of being printed on the surface. Shipping and contact information is at the bottom of the page plus a link to see customer feedback. The Dog Neckties page has more Hunting Scene Neckties. 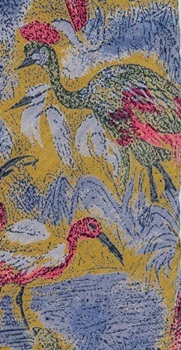 There are Domestic Geese and Duck Neckties on the Aquatic Bird Necktie page. Only these "Collector" ties have been gently used by a previous owner (no flaws or stains). Many of my customers collect ties in specific themes and I help them find treasures. Some ties were given as gifts to the wrong person and get passed on without even being worn. Other ties might have been chosen for a specific occasion and rarely worn again. Consider these ties for a nice price on a beautiful tie that is no longer being printed. Return it if you are not pleased. There is a carved balsa wood Pheasant, Chicken and Duck Pen plus many Songbird Pens. There are also several styles of magnets for birds on this page.